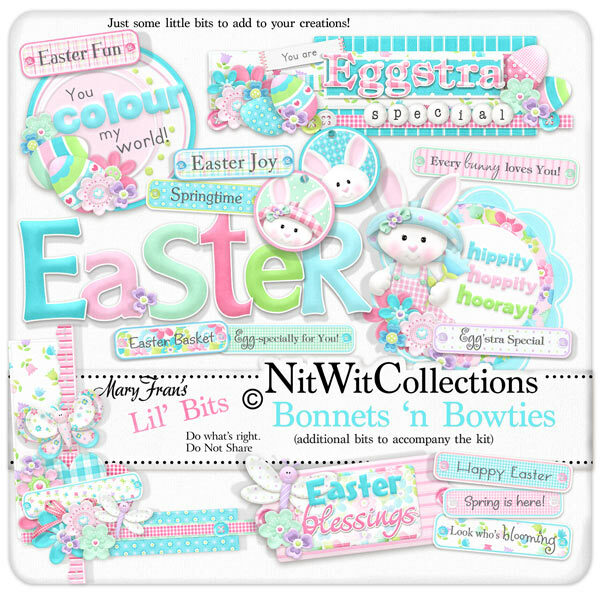 "Bonnets 'n Bowties" Lil' Bits is bursting with extra bunnies, Easter, Spring, and colourful elements and word tags! Elements in the Lil' Bits are NOT included in the "Bonnets 'n Bowties" FQB. 2 Circle tags - 1 blue and 1 pink, how could we leave out anyone? 1 Corner element - can you guess where the best placement for this element is? 1 Wordart - "Easter Blessings"
2 Wordart - "You colour my world" - 1 has the spelling of "colour" to be "color"
1 Wordart - "You are Eggstra Special"...and you are you know! 1 Wordart - "Hippity Hoppity Hooray"
10 Wordstrips that contain sayings for Easter and Spring time. Who would've thought it? ?